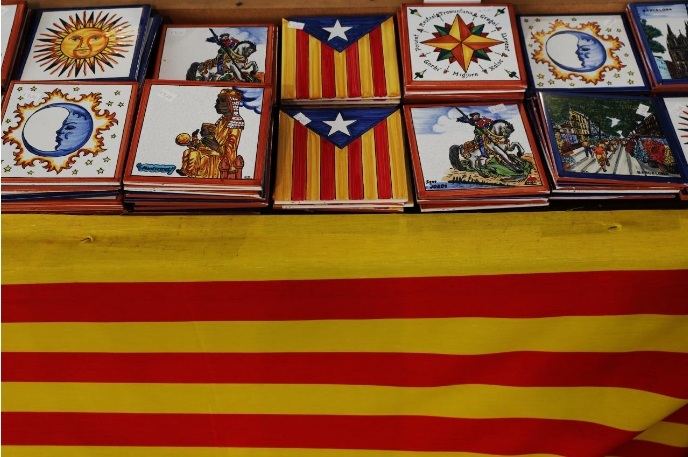 Tiles with the Estelada (Catalan separatist flag) are displayed on a table covered with a Catalan flag at an arts and craft market four days after the banned independence referendum, in Barcelona, Spain October 5, 2017. BARCELONA/MADRID - Catalonia’s parliament will defy a Spanish court ban and go ahead on Monday with a debate that could lead to a declaration of independence, a regional government official said, as Spain’s worst political crisis in decades looked set to deepen. “Parliament will discuss, parliament will meet. It will be a debate, and this is important,” the Catalan government’s head of foreign affairs, Raul Romeva, told BBC radio on Friday. It was the pro-independence regional government’s first clear response to a Constitutional Court decision on Thursday to suspend Monday’s planned parliamentary session, and it raised the prospect of a tough response from the central government. Spanish Prime Mariano Rajoy has offered all-party political talks to find a solution, opening the door to a deal giving Catalonia more autonomy. But he has ruled out independence and rejected a Catalan proposal for international mediation. On Thursday, the speaker of the Catalan parliament, Carme Forcadell, said parliamentary leaders had not yet decided whether to defy the central court and go ahead with the session. Romeva told the BBC that the crisis could only be resolved with politics, not via judicial means. His remarks hit Spanish stocks and bonds, including shares in the region’s two largest banks, Caixabank and Sabadell. Sabadell decided on Thursday to move its legal base to Alicante. Caixabank, Spain’s third-largest lender, will consider on Friday whether to also transfer its legal base away from Catalonia, a source said. The court’s suspension order further aggravated one of the biggest crises to hit Spain since the establishment of democracy on the 1975 death of General Francisco Franco. Secessionist Catalan politicians have pledged to unilaterally declare independence at Monday’s session after staging an independence referendum last Sunday. Madrid had banned the vote and sought to thwart it by sending in riot police who use batons and rubber bullets on voters. In a separate development that could raise tensions, Catalan police chief Josep Lluis Trapero was summoned to Spain’s High Court on Friday to answer accusations that he committed sedition by failing to ensure his police enforced a court ban on holding the referendum. Unlike national police, Catalonia’s force, the Mossos d‘Esquadra, did not use force to prevent people voting. Spanish Economy Minister Luis de Guindos told Reuters in an interview on Thursday the turmoil was damaging Catalonia, an industrial and tourism powerhouse which accounts for a fifth of the national economy. In addition, two sources said the central government will on Friday approve a decree making it easier for companies to transfer their legal base out of the region, potentially dealing a blow to the region’s finances. Opinion polls conducted before the vote suggest a minority of around 40 percent of residents in Catalonia back independence. But a majority wanted a referendum to be held, and the violent police crackdown angered Catalans across the divide. Catalan officials released preliminary referendum results showing 90 percent support in favor of breaking away. But turnout was only about 43 percent as Catalans who favor remaining part of Spain mainly boycotted the ballot. Catalonia’s parliament will defy a Spanish court ban and go ahead on Monday with a debate that could lead to a declaration of independence, a regional government official said, as Spain’s worst political crisis in decades looked set to deepen.